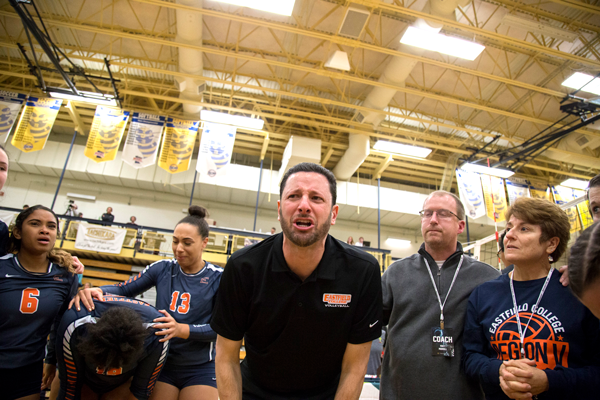 ROCHESTER, Minn. — It was the best game of volleyball Eastfield head coach Brandon Crisp said he’s ever seen. The Harvesters had come back from a two-set deficit in the third, tied the match in the fourth and were at the end of the fifth set of the national championship final. It was Owens Community College’s serve. The score was 14-13 and Owens needed to reach 15 with a two-point lead to win the match. The ball shot over the net toward Eastfield. Sophomore libero Maura Munoz dove to the right to dig it, but she didn’t make it in time. The ball bounced off the wooden court and into the crowd. When the ball hit the court in Owens’ match-winning 15th point, Munoz looked up to the ceiling and fell to her knees. She pulled her jersey up to cover her face as she teared up. The road to Rochester and the national tournament wasn’t easy. The Harvesters went undefeated in conference play in 2017. This year, they lost a match to Brookhaven and almost gave up their chance to host the Dallas Athletics Conference tournament, which decides who goes to the national championship tournament. 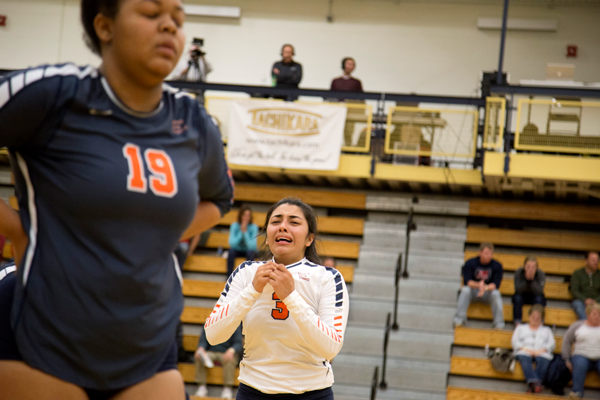 In what sophomore outside hitter Kiki Reyes called a miracle, Brookhaven lost to North Lake in its next game and handed the host privileges back to Eastfield. Eastfield, with new motivation, squashed other district squads in the DAC tournament. The two matches before the championship game were easier wins than the ones in conference play, two 3-0 victories — one over Lorain County Community College and one over Central Lakes College. The championship game against Owens was a very different tale. Eastfield dropped the first two matches, 25-20 and 25-17, and picked up wins in the third and fourth match, 25-20 and 25-19. Shelby Browning said that in the third set, Eastfield and Owens were two teams playing to their best ability. “You don’t see that very often,” she said. The fifth set started with an early lead for Eastfield. But Owens turned the tide, grabbing a 10-7 lead as Crisp called a timeout. They were close. The Harvesters came back out and tied the set up 11-11, then lost control of the serve. The final score of 15-13 was devastating for the squad, especially the sophomores. Reyes, Kalli Caddell, Alex McPherson, Naisjah Rivera, Jade Turner, Mica Turner and Chloe Hope and Munoz had just played their last game as Harvesters. It was also the last game for third-year team manager Alyssa Tomlin. These sophomores had been through a lot together — a national title last year, a hard-fought conference championship this year and even a special Pink-Out match to bring attention to Munoz’s mother’s fight against cancer — but as is the nature of two-year sports, their time as a team was limited. After the game, the team gathered in the locker room and the sophomores shared stories and memories about their time with the Harvesters — a team tradition. 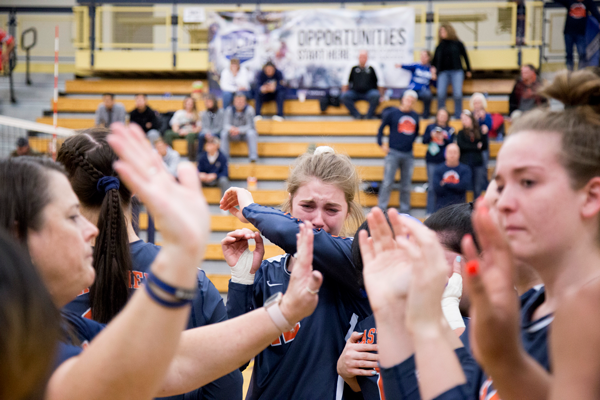 Munoz recalled the support she received from the squad when she told them about her mother’s cancer — a rough memory for most of the team — and Alex McPherson cried as she recalled the way the team helped her break out of her shell, on and off the court, and play fearlessly. It was an emotional moment for Crisp, too. He told the players how, when the team showed up in Rochester three years before, nobody knew who they were. The program changed the players’ lives, too. Caddell didn’t think she would ever play volleyball again after high school. She had applied to two universities and never heard back from one. She was called the “second choice” by the other. Crisp was the only coach to offer the 2018 All Tournament team member a spot on a squad. Crisp grabbed a Kleenex to wipe his eyes as they welled up.